Patternfish greets August with two knitters, one is well known and at the height of her design career. The other, a knitter who is in her own words, “addicted to knitting everyday” is about to leap into the world of design. They are Anne Hanson of Knitspot and Trish Denhoed, now known as TrishD in the knitting world. See our Editor's Choices, One Skein Patterns, Patterns for Men, and our New Designers, too. This month Patternfish's Prime Minister is taking a bit of a break and we're replacing her pattern choices with a collection of our world exclusive designs. These are patterns that are available only on Patternfish. Not in print. Not downloadable anywhere. Just Patternfish. Go to Patternfish World Exclusive Patterns to check them all out. Diane Soucy, aka Ms. Knitting Pure and Simple, has branched into cables and seed stitch for her customers’ delight with this glorious reworking of her simple raglan sleeved, crew neck, top-down, no-sew sweater. But fear not, Knitting Pure and Simple fans, for all its Aran-like styling, the Beginner Cable Pullover does not stray from the reliable, easy to knit patterns you know. This hat by Carolyn Doe is in one of my favorite stitches, seed stitch, also known as moss stitch across the pond. It’s an excellent hat for a hat person and I’m eager to make this. I just wish I were one of those hat people. There are advantages to this pattern beyond its perky charm. It takes just one 100gm skein of yarn and that yarn is worsted weight for quick knitting. As soon as the cooler weather starts, I want to make a new cowl. They say that you need to keep your head well covered to stay warm, but for me it’s my neck and feet. Then I’m happy. LynnH takes wonderful advantage of the magnificent skeins of yarn now available with each of her patterns. Check out the extra photos on the Sprite Cowl/ Collar pattern page for more yarns and inspiration. Recently I was helping a relatively new knitter find a bootie pattern that her daughter would like. The decision criteria were: nothing too delicate, easy to knit, worsted to bulky weight yarn, very little sewing, not too challenging for a new knitter. We found Little Paws by Angela Juergens and both of us love it. It’s a good pattern for a beginner with lots of notes and detailed instructions. I originally chose Melissa Leapman’s unisex scarf, Gabriella, for the men’s patterns section of this newsletter, but the more I looked at it, the more it called out to me, so it’s now in my personal choices. Here’s why - the reversible stitch that’s different on each side is intriguing, charts and written instructions are included, and it’s in a DK weight, perfect to reduce my stash. Great gift, too. It’s fun to watch a Gansy design develop as you knit and there is something very satisfying about the feel of purl stitches against the smooth stockinet. This Reynolds pattern is charted and a chart with just knit and purl stitches is a good way to learn to use them. I like the chalice design on both front and back and the neat finish on the hem and cuffs. This month’s patterns for men are a cozy, textured pullover from Elizabeth Jane Musselman, a Nashua sweater design requested by a Patternfish customer, and felted and crocheted slippers from Knot*Sew*Cute. One skein patterns this month are a shawl that’s mostly spaces between the lace weight yarn plus beads to keep it earth bound, a cowl designed to take advantage of highly variegated yarns, and a sweet quick-knit ascot. 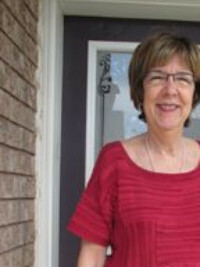 Hanson’s knit design business is built on her fashion background as a tailor and pattern maker. She’s passionate about garment design and construction, and approaches them with an eye for universal appeal. While some designers have a particular customer in mind, Hanson thinks about style choices that will look well on MOST people, across the widest size range. Most Knitspot patterns, including shawls, scarves, hats, and mitts, have an unusually wide range of choices. The Twig and Leaf shawl can be created in three sizes: petite, medium, or tall, while the Leaving cardigan (the editor’s personal favourite) may be created in cardigan or pullover options in any of nine sizes. October Zest includes fingerless mitts and hat in four sizes and a muffler in two. Hanson also has the knitter in mind when she suggests lots of different yarns to suit a design and includes many photos on the light show on our pattern pages. Hanson’s reputation in the knitting world is mainly as a lace knitter, but creating structures was a force that drove her even as a youngster, and a curious youngster at that. “I was observing fabric behavior and figuring out how garment pieces were cut to create style lines. I started by manipulating the shapes of sewing patterns to see what happened.” One of the things that happened was designing garments that are beautifully shaped like Blumchen, Ondule, and Rene. It takes commitment, passion, and discipline to become an established designer. What drives you? My goals now are surprisingly similar now to what they were early in my life but now on many more levels. I want to see what happens if I do A vs. B. That applies to composing a surface design, choosing a structure for it, deciding on yarn, writing up the pattern, and eventually selling it. We have so many gorgeous materials available to us and a much more immediate and responsive environment. I'm constantly trying to make better garments and better patterns. What’s been your greatest personal challenge? Maintaining a consistent amount of time for artistic endeavor has been a challenge all along—it's so easy to get sucked in to the work of running the business, answering email, figuring out marketing, etc., instead of carving out and protecting non-negotiable time for knitting and designing. What inspires you? I am inspired by nearly everything around me, from nature to people, to fashion, to architecture. I'm constantly distilling a rather chaotic array of visual material down to a few components that become a composition. What did you have to learn or unlearn, to become a successful designer? One thing I had to unlearn was my idea that everyone would want very complex, intricate, and über-unique knitting projects—not true! For a successful business, it's important to have a good mix so that knitters of all levels and temperaments can access my work. I was personally attracted to more complex knitting and design projects and at first, I didn't understand that many knitters want exactly the opposite for their own projects, or that they want to learn new techniques at a much slower, more digestible pace. I had to get over the idea that offering simple, accessible patterns reflected negatively on my body of work. So many customers have positive experiences starting with a simple pattern and often take on a progression of more challenging projects after that first success. I'm pleased that we have something to offer for every step of that journey. What are your best selling designs? They are a mix of both simple pieces and more complex. The Miss Doolittle scarf, Caissa cardigan, and Cradle Me are easy patterns while the more intricate and complex best sellers are the Sky Ladder Blanket and Sticks and Stones. 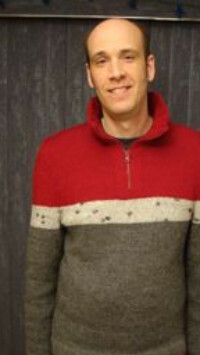 Sweaters are definitely gaining in popularity now that we have a nice collection of them. Lace shawls and scarves are popular, too, like Frillibet, and Isadora. Which designs are your personal favourites? Oh gosh, that is a really tough question. I have always loved Hypotenuse, which was the first man lace I knit for David, my husband and partner, but I don't know if I could get through winter without my Highlander Sweater. Who could resist the Cabled Keyhole Scarf? It’s adorable, quick and easy to knit! Patternfish customers like the delicate beauty of Fernfrost, the gift-worthy Haselnusse, and Rivolo. Do you have established goals for your business? Oh, absolutely! not having goals would be like driving in complete darkness. We have pretty much accomplished everything we've set out to do as a company so far. At first, my goal was to see if I enjoyed writing, so I started a blog. Readers began to request patterns for my original work so I started an on-line pattern shop. My next goal was to become established enough that my design income allowed me to quit my day job as a production artist. Next it was to grow the business so my husband David could join me in running it. Then we decided to make an investment in offering yarn clubs and are now launching the third year. They have finally allowed me the space and time to write books. Our clubs have now led us to offering our own yarn lines under our Bare Naked Wools label, thus fulfilling a dream of mine of working with fiber and textile in a more in-depth way. I plan to write more about the different fibers that we work with and the process of making yarn. How do you imagine the knit/crochet/fibre world will change in the next 10 years? Ten years is a long time nowadays; ten years ago, many people did not use the internet or even email. Designers have emerged as an independent and powerful sector of the fiber industry; that was undreamed of up to now. Where do you think you and your business will be in 10 years? Do you have any unfulfilled wishes or dreams for your business or yourself? I fervently hope that we can continue providing designs and patterns that are pleasing to knitters everywhere and that we can establish ourselves as a go-to resource for wonderful undyed yarns. With our Bare Naked Wools, we have brought together modern design, great local suppliers, terrific artisan mills, and a serious desire to make top-quality yarn. We hope it it also attractive to others! How did you come to the decision to list your patterns with Patternfish? I've been listing patterns on Patternfish for a while; I don't remember exactly how we made the decision, except that it seemed like a great way to get our products to a new audience. It's been a great relationship. Find all of Anne Hanson’s Knitspot patterns and her e-books here. In July, we welcomed six new designers and publishers. The Mirasol Project was launched in 2007 to support local communities in Peru through sales of the Mirasol Yarn Collection and patterns designed by Jane Ellison. Mirasol debuts at Patternfish with Juliaca, a splendid cardigan design in Miski, a worsted weight yarn from the highlands of Peru. Juliaca is a flattering garment mainly knit in a 2 x 2 ribbing with easy cable patterning at the hem and turn back cuffs. Look at the garment photo in blue on the pattern description page to get a good look at the rich hem. More designs from the older books as well as new designs, like this Patterned Yoke Pullover from Michelle Porter, are being added frequently. Andrea Rangel begins at Patternfish with Flow, a shawl aptly named for its lovely drape, all-at-once construction, and lace edging reminiscent of waves. Shawls are a speciality of Rangel’s but she also creates lovely and knitable garments and accessories including her sweet Hex Socks. Megan Grewal debuts with her Organic Seasons Jacket, sized for children from 3 months to 10 years. 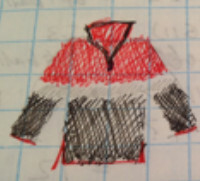 Like all her garments, this jacket pattern avoids sewing. It has the body knit flat, sleeves knit in the round, and hood knit seamlessly and grafted to the neckline. You could include just one or two intarsia leaves on the border if desired. Look, too, at Little Willow, and see if you, too, like me, would like to see this jacket sized for adults. Andi Smith begins with her Queen Street Cardigan, all elegant lace with the look of a vintage shawl. Smith provides lots of tips and hints for customizing this top down garment to make it your own. This designer tackles something new with each design. Take a look to at Bide, too, a basic top down cardigan with chain stitch embroidery that sets it apart. Debonair Designs are skillfully wrought patterns for American Girl Dolls and comparable 18” dolls. The first design on Patternfish, The Sienna Collection, modeled by American Girl doll, Jess, includes a complete outfit, dress, jacket, hat and tote bag. You’ll find careful construction details just like big girl knits. Desiloop’s debut design, Jaali Knitted Shawl Variations, a mesh confection (Jaali is Hindi for ‘mesh’), is a good choice for new lace knitters with most of the shawl knitted in an easy mesh stitch, and finished with an eight row border. Don’t imagine that Desiloop designs just shawls or knit patterns. In her collection, you’ll find hats, crocheted shawls, and sweet children’s garments. I’ve long been fascinated by the process that takes someone from being a non-knitter to a designer. Trish is a firm believer in life-long learning, is insatiably curious, and is a perfectionist about fit. Her mom was a knitter. When she was a teenager, Trish sewed her own clothes. She’s 6’1” tall. The adjustments she needed to make garments fit well required an intimate understanding of construction. She became good friends with a designer who became her mentor. My mother taught me to knit as a teenager and began with a Norwegian or Icelandic pattern for a sweater and mitts. Beginning with Fair Isle seems very odd, but it may explain my love of working with colour. At the beginning, if I dropped a stitch, Mom would fix it, but without her I was lost. I gave up knitting. At the age of 16 I was my current height, 6’1”, and finding clothes that fit was difficult, so I learned to sew. It’s not quite so hard these days to find clothes for me, so now I can knit and crochet instead of sewing. When faced with six weeks of bed rest at the age of 20, I got a book and taught myself to crochet. I loved the fact that there was only one stitch on the hook to worry about. No more dropped stitches! I crocheted a lot and was always searching for interesting patterns. I developed a friendship with Ildi Pal, then owner of The Wool Mill in Toronto. Eventually she got tired of trying to find me adequate crochet patterns and insisted that I take her knitting classes. In one of the first classes she borrowed my knitting to show us something and promptly took the needles right out! Imagine my horror! But she had done it on purpose to teach me how to deal with that. The lessons “took” and I am forever grateful to Ildi for teaching me the details of knitting and for remaining my friend to this day. Oddly, she stopped knitting 25 years ago! Guess I took over for her. At first I stuck with simple knitting patterns with fairly large needles, but soon became bored, wanted more challenges, and liked the look of finer gauge knitting. As my confidence grew I began adjusting patterns to fit my tall frame. My son grew to 6’5”and became an artist. He began to draw sweaters and say “Mom, please knit this for me.” The first few sweaters were not great but now I am pretty good. After joining Toronto’s Downtown Knit Collective about 10 years ago, I was inspired by the company of so many knitters. Eventually I felt confident enough to join in the ‘show and tell’. When I got great feedback from that, I was inspired to try even more new things. In May 2008 I joined Ravelry as TrishD and it is a huge inspiration. The database is so full of wonderful information. In 2009 I knit my first sock. How had I waited so long? Since then I have knit at least 20 pairs and really hate to wear anything else. I am a big fan of Cat Bordhi’s unusual toe up version and teach it now to others. In January 2011 I was lucky to attend the first Vogue Knitting Live in New York. The energy was very high and everywhere you turned there was another masterpiece walking by. Fabulous. After returning from NYC I renovated my home office and built a wall for my stash. I find having it “in my face” every day relaxes me, inspires me, and makes me want to knit faster. Last fall, I began teaching. I enjoy being able to share what I have learned over the years and I also started test knitting for Robin Hunter and Mary Pat McDonald. I have been told that my colours are getting brighter and deeper and I have to agree. With confidence comes more colour. I now rarely knit a pattern as written. I will add length for my frame, but will also change the fit, or move a stripe, or add a colour, or leave out a cable, just to make it my own and please my own creative juices. My mentor, Patrick Madden, has assisted me with this growth. At a retreat, the YarnOver SleepOver at Fern Resort, I was introduced to Patternfish and I have found several patterns there that I really want to pursue. Trudy Van Stralen’s Ashley Skirt caught my eye because I am as passionate about ballroom dancing as I am about knitting. This skirt would swirl very nicely on the dance floor. Helene Hammann’s Fan-Like Pullover intrigues me because of the unusual construction. Deb Gemmell’s Summer Braids caught my eye. I like the cables and the relaxed design. The Claire Trent Cardigan is on my wish list ever since I did the test knitting for designer Robin Hunter. I love the way the cable runs up the side of the neckline! Deb Hoss’s Elizabeth pullover looks very nice; quick to knit, then interesting work on the cowl. Daniele Dietrich’s Reseda for Louet has been in my stash for 2 or 3 years! I think it’s the adjustments for my tall size that are keeping me back from this one, which is knit side to side. The Rope-Cable Pullover with Lace Edging by Robin Melanson for Naturally appeals to my eye for cables and lace insets. It would be a great anytime pullover and I am crazy enough to knit a sweater at 7 stitches to the inch! Robyn Gallimore’s Eliza Shawl appeals to my coloured knitting urge. What is next in my evolution? Friends are encouraging me to post some of my designs, but that still feels very frightening for me. Perhaps I will start with a baby blanket I made recently. I might also look into Tech Editing since I am good with details and a proficient knitter. One of the best things to come from my knitting is the wonderful friends I have met. Knitters are often down-to-earth, generous and eager to help others; nice people to spend time with. Meanwhile: I will stay calm and knit on.